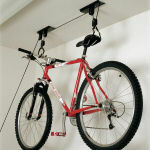 If you’re looking for the ultimate system in bike storage, this is it – the ceiling mounted bike lift pulley system. I know people like to throw around words like “ultimate” and “best” all the time when describing a product. As consumers we’ve been jaded by such claims of greatness, but when I use that term to describe this bike storage system, I mean it in every sense of the word – this is the most effective way of conveniently storing your bike in a location that you’ll never trip over it. I’m prepared to back up that claim with solid evidence. Do you know how to operate the blinds on your windows? You pull the string down and the blinds go up. To do the opposite, you apply tension and pull the string slightly away from the locking mechanism, and the blinds go down. Operating this bike pulley storage system is the exact same thing. You hook the hanging claws to the handlebars and your seat, and then you pull the rope to raise the bike to your ceiling. You don’t have to worry about safety or the bike falling back down as you’re pulling it up. Why? The unique rope locking mechanism engages after every pull. That means with every pull, the rope is locked into place. So it’s safe and easy to operate, but why would you want a system like this in the first place? I’m betting you’re probably looking for an effective bike storage solution because space is at a premium where you live. You might be tired of tripping over your bikes as you try to get to your car. Leaning your bikes on the side of the wall is not exactly the most effective and space friendly location to keep your bikes. I’ve talked about this in other products available on this site, but it’s important to use your space efficiently. You only have so much floor space in your garage, so why not use some of your ceiling space for storage. The nice thing about this pulley system is that you won’t need a ladder to get your bikes down off hooks. You don’t have to bear the load of the entire bike as you lift it down from a ladder. You simply pull the rope and the bike lowers. I love “high” storage and this qualifies. The bike is out of the way, it takes only 30 seconds to get it down or put it away, and neither my head nor anyone else’s will hit the bike wheels. The unit is easy to install, and should be ready to go in 10-15 minutes. There is no assembly of the pulley assemblies required. You simply need to mount them at the desired location. All of the mounting hardware is included. You just need a tape measure, a Philips screw driver, and if you don’t know where the studs are in the ceiling, a stud finder could come in handy. Installation is as simple as measuring the distance between your handlebars and bike seat, mounting the pulleys and the corresponding distance, and stringing the rope. The entire pulley system weighs in at under 4 lbs., so there’s no need to worry about how you’re going to get the pulleys mounted on the ceiling. It’s lightweight, yet built with a solid steel construction for maximum durability. The rope is 48 feet in length and made of durable nylon, so you can be sure it will be capable of handling even the most frequent biker’s needs of lifting and lowering. Installs quickly, it’s easy to use, and it does a great job of keeping my bike out of the way in an already busy garage. Great value for the money. First of all, I don’t know who’s bike is 50 lbs, but in case you have one of those, the bike lift is rated for up to 50 lbs. The beauty of the pulley system is that it enables you to effortlessly raise the bike to the ceiling – even the really heavy ones, and it doesn’t even feel heavy! The ratio of item weight to lifting weight is 4:1. That means if your bike weighs 32 lbs, it feels like you’re lifting 8 lbs. I think we can all handle that. Easy installation with provided hardware. Only tools needed are a screwdriver and a tape measure!